Growing up outside of St. Louis, there was a Six Flags only a forty-minute drive away. You could look right off the highway and see the sprawling parking lot, the giant Ferris wheel, and the twisted metal of all the roller coasters. The most imposing snake-like construction was Batman: The Ride. For me and my friends, it was almost a rite of passage to ride this thing. Once you had traversed the enviable "you must be this tall" sign, you jumped on Batman: The Ride until you puked your guts out. 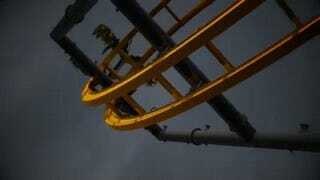 In 2015, Six Flags hopes to add another Batman ride to its legion of roller coasters. This time in San Antonio, Texas. But this isn't your traditional, legs dangling thrill ride. Instead, this guy will also rotate your seat 360-degrees as you travel along its tracks. The Los Angeles Times describes this metal monstrosity as the first of its kind and a crossbreed from the Green Lantern 4D coaster and the X-Flight wing coaster, both at other Six Flags theme parks. I will say I do appreciate Six Flags setting the scene with this teaser trailer, complete with ominous skies...because Batman!